Corey Colapinto is a young, talented surfer born and raised in San Clemente – Southern California’s mecca for performance surfing. Smooth, polished, and stylish are all adjectives that are used to describe his phenomenal riding abilities. We spoke with Corey to learn more. I’m from San Clemente and my childhood had a lot of family surf fun. My dad runs a surfcamp and so I learned a lot of beach stuff there. I don't exactly know. My dad has had a big quiver of boards since I can remember and I rode those for a long time. The first time I stood on a surfboard I was about 3 or 4 going tandem with my dad on his 11 footer. He would put me in a lifejacket and on his back, then swing me around once he caught the wave. They’re my first memories. Your cousin is a competitive shortboard surfer, right? How did you choose to take a different path? Yeah! My cousin Griffin is a doing really well. I’m so stoked for him – he just qualified for the World Tour. We competed with each other all the time as kids. About 6 years ago I stopped competing and got into longboarding after seeing just how my dad was psyched to surf on just a regular shoulder high day. He’s been a big influence. Of all the places you have traveled to, what place in particular stands out? One place I have loved is Saladita in Mexico. I got to surf the wave with CJ Nelson, Devon Howard, and Karina Rozunko – all of whom I look up to. It’s a left point break really fun for a noserider and for a shortboard when it was a little bit bigger. You’ve got a smooth surfing style. Who/what inspires your surfing? Thanks! Some surfers that inspire me are Tommy Witt and Ryan Burch. The way they can ride shortboards, mid lengths and longboards is so fluid it’s inspiring. It used to be something that took priority in my life, but now I know that it’s a great way to get to know and love on people. God’s love for all of us. Kai Lenny on his foil board is definitely breaking now ground and so is Ryan Burch with his asymmetrical boards. My favorite shortboard is a fish that I have from Ryan Burch. 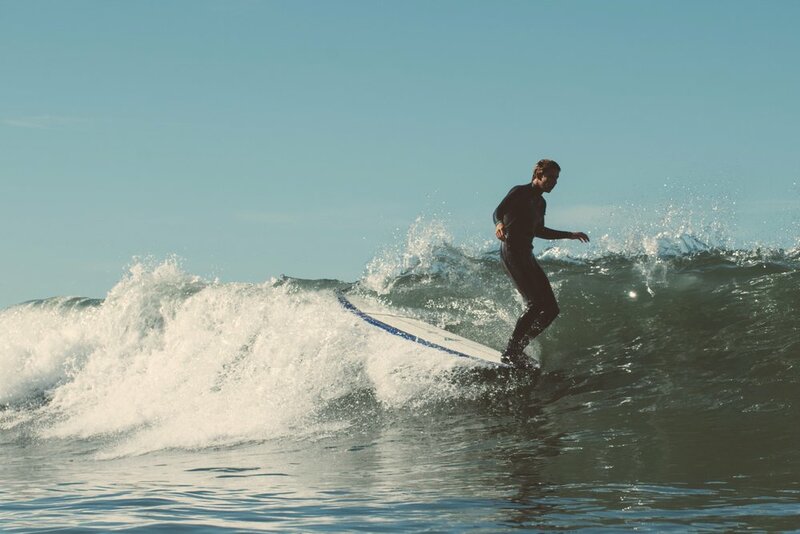 My favorite funboard is the 8’3 “Colapintail" I designed with Ryan Engle and CJ Nelson. And for longboards the “Classic” by CJ is one of my favorite noseriders. I have been listening to United Pursuit lately. I love their music. I am most grateful for Jesus Christ. What's next for Corey Colapinto? For the next couple years I am planning on finishing school to become a school teacher. Follow Corey Colapinto on Instagram @kookapinto. Photographer James Tull can be reached at jamesrtull@gmail.com .